I did some writing on this subject several years ago and decided to revisit this subject. I’m one that totally believes in having as true a free market place economy as possible. A genuine true free market place economy never fails, that is because it works in line with nature. Nature has a life and death cycle, which we see as normal, but we know everyone, is going to die sooner or later. What many of us don’t seem to know is every economy must have a boom and bust cycle to get rid of negative over-powering anti-survival threats. Most people believe a bust cycle is a bad thing that should be staved off forever. The reason a true free market place economy is so successful and never fails is because of its not so obvious discipline. A true free market place economy with it’s purging power discipline protects itself and prevents other threats in a society from growing out of control. “Free and Natural” are two key words that maintain a healthy true free market place economy. In my view there are only two players in an economy no matter how complicated it may seem, those two players are a seller (merchant) and a buyer (consumer). And if government would just stay with collecting taxes and act as a neutral referee a free market place economy would police and manage itself far better than what’s happening now. If government had butted out our society would have a strong nuclear and extended family system, proper norms and traditions would be instilled and enforced in our very young, and very few people would be dependent on government for their sole survival. So, when a bust cycle did show up to purge out anti-survival threats like culture rot and moral decay it would be a little more than “A piece of cake”. Today our super provider welfare state government is dumping billions upon billions into our private economy claiming to help the poor and needy. But, look what that has got us twenty trillion in debt and the destruction of our culture and morals. Plus, we are left with no emergency backup capacity to barter and trade if our economy collapses. I don’t know what kind of economy we have today, but it is not even close to a true free market place economy, period. In my view the only way for government to aid and help the poor and needy without destruction to the national economy is to use a dual track system. In my view only two things that can save the USA and Western civilization, get rid of all minimum wage laws entirely and stop giving out billions upon billions of government dollars on an individual basis to be dumped into our private national economies. What I mean by dual track is use a separate system to keep all individual basis government money from being dumped into our private free market place economy, thereby distorting it and driving up the cost of living. I’m one that believes that helping the poor and needy should first be done by the family, extended family, church, community organizations, and government last and then on a set temporary basis only. Otherwise, government dependency will destroy the nuclear family by taking away the survival need for it to exist. All of that said: Government must come to the aid and help the poor and needy, period. But, the only way the government can help the poor and needy without destroying our private free market place economy is to use a dual track system. Dual track: Government must establish or contract out its own commissaries, clinics, and housing units and use separate tokens or script as the currency for all that qualify, that will prevent mass government dumping of money into our private national economy. The amount of government spending doesn’t matter, it is the individual basis spending dumped into our private U.S. economy that contaminates and drives up the cost of living for all of us. Also, a minimum wage law binds the purging power of a free market place economy and won’t let it protect itself or the nations culture, morals, and values. SIRMANS LOG: 21 DECEMBER 2016, 1650 HOURS. Sure, I believe the November 2016 presidential election was a dilemma between two extremes. Also, I believe if the liberals had won it would have been the end of individual freedom in America (USA). I wrote at the beginning of the primary that I believed that Mr. Trump was a catalyst to a main event, to what we'll just have to wait and see. I don't know who coined the phrase "Fake news"; but I feel it had to be a liberal. The words themselves are a contradiction, news is news, it can be true, untrue, good, bad, or ugly it's still real, not fake. This is just another way the shallow minded liberals distort reality. Besides: there is already a word for factually untrue news, it is called propaganda. For many years liberals has almost totally dominated the news in the USA, but today that is no longer the case. With the Internet and talk radio most people today of sound mind and common sense no longer fall prey to liberal hogwash and propaganda. I'm one that is beginning to feel the U.S. may have a chance of being saved from total liberalism self-destruction. Thank God. 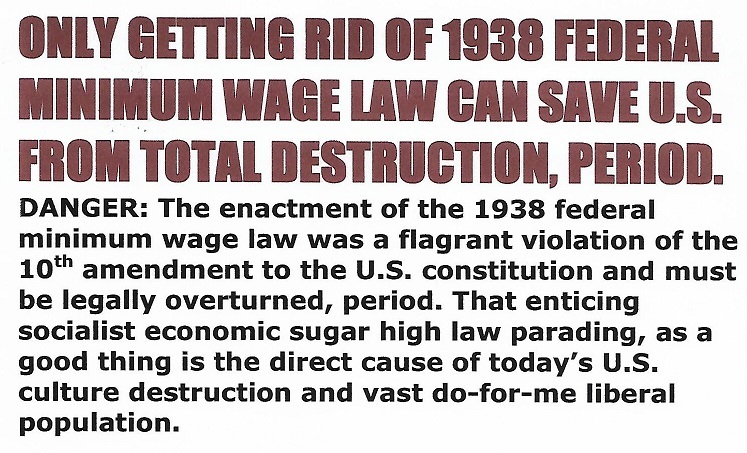 Still, in my view only repealing our insane arch-evil 1938 socialist minimum wage law can save us. SIRMANS LOG: 16 DECEMBER 2016, 1305 HOURS.